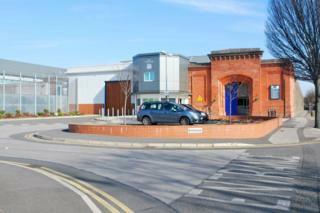 Inquests have opened into the deaths of three HMP Nottingham prisoners - following five deaths in the space of a month. Two of the men, 29-year-old Shane Stroughton and 38-year-old Anthony Solomon, died at the category B prison. Andrew Brown, 42, who had been living in a cave before he was jailed, died in hospital after being found hanging. All of the inquests were opened and adjourned in Nottingham by assistant coroner Ivan Cartwright. No cause of death was given for any of the men, and final post-mortem examinations still need to be carried out. The first inquest opened was for Mr Stroughton, from Kirkby-in-Ashfield, who died on 13 September. Mr Cartwright said: "Mr Stroughton was a serving prisoner and was in a single cell on D wing. "He was found at approximately 5pm on 13 September by a prison officer on his usual routine rounds. "The circumstances within the cell are consistent with the use of a ligature." Paramedics and others administered CPR, but Mr Stroughton was pronounced dead at the scene in his cell. The second inquest opened was for Mr Brown, who lived in a cave in Baslow, Derbyshire. He died on 17 September at the Queen's Medical Centre in Nottingham, five days after he was found hanging in his single cell on D wing at the prison. Mr Brown had an hypoxic brain injury, which is caused by lack of oxygen. The third inquest opened was for Mr Solomon, from Bulwell, Nottingham, who died on 27 September. The inquest heard that Mr Solomon was in a shared cell on B wing. Mr Cartwright said: "The alarm was raised by his cell mate, a fellow prisoner, that he had found Mr Solomon lying on the floor of the cell unresponsive." Mr Solomon had been a remand prisoner since 23 May 2017. He was identified by a prison officer who knew him. A Prison Service spokesperson said: "HMP Nottingham is working closely with health colleagues to increase the support available to vulnerable prisoners and are increasing staffing levels which will boost safety and stability at the prison." On Friday, the Ministry of Justice said HMP Nottingham prisoner Marc Maltby, 22, died in custody on 12 October. His mother told the Derbyshire Times he was about three weeks into a four-month sentence for "petty stuff" including not attending probation meetings on time. The coroner has also been informed of the death of Carl Armstrong, who died on 6 October. His inquest is due to be opened on 26 October. The deaths are also being investigated by the Prisons and Probation Ombudsman (PPO).